This waterfront hotel is just minutes from the San Francisco International Airport and well connected to downtown San Francisco via the BART. The hotel offers a stylish introduction to the Bay with the Greatroom, a space to connect and unwind with free Wi-Fi and hand-crafted cocktails. Reimagined guest rooms and suites feature picture windows, locally inspired art and intuitive design. 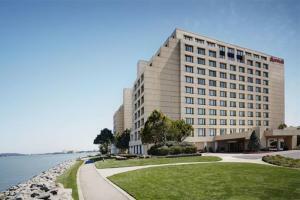 Located just minutes from the San Francisco International Airport and 15 miles from downtown.